Just print this A4 page out and then fold it according to our origami booklet instructions - and you've got an instant mini booklet to fill up with all your pirate lingo! The kids will have fun finding out what all this pirate lingo means and filling in our pirate glossary. Get it done in time for Talk Like A Pirate Day and you'll have a blast Yo Ho Ho-ing to each other! 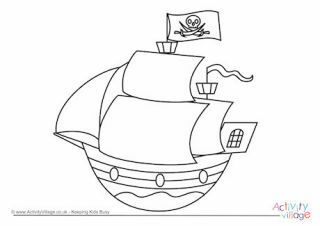 Children will love colouring in this terrifying pirate mask, cutting it out and wearing it while putting on their best pirate voice. Argghh! Don't forget to poke some holes for the eyes! Our mini pirate dictionary is the perfect size to tuck into a pocket or backpack and bring out when you need some good pirate language! Print out our pirate glossary and display it in the classroom or on the fridge so that the kids can prepare their pirate vocabulary for Talk Like A Pirate Day or a pirate party! We've got lots of pirate lingo for you on this set of pirate lingo cards! The cards are designed to be double-sided: just print onto paper, fold in half along the vertical line and glue back to back, then cut around the edges. This very swashbuckling pirate mask is sure to keep the kids busy and happy for a while and could be particularly useful on Talk Like A Pirate Day or for a pirate party! Dress up as a pirate for the day with the help of this pirate mask, complete with eye patch, pirate scarf and gold ear-rings! There are 8 pirate "vocabulary" words here to put into alphabetical order - a fun activity on Talk Like A Pirate Day! Here's a slightly harder pirate alphabetical order worksheet, with 12 fun pirate words to put into order, cheered on by that dastardly pirate Blackbeard, with his smoking hair! Hunt for the classic pirate expressions in this lovely big word search puzzle - perfect for Talk Like A Pirate Day, a pirate party "going away" bag, or any time! This is such a fun idea for Talk Like A Pirate Day or any pirate theme. Get the kids thinking in pirate lingo and practising their conversational writing at the same time! It's hardly work, is it? Here's a challenge for the kids: write a script between the two pirate characters. Why not have a go at this on Talk Like A Pirate Day and then take it in turns reading the scripts aloud?